The depth of juvenile talent within the Godolphin ranks has been one of the overarching stories of the season and, in a fitting demonstration of their two-year-old firepower, Kiamichi led home a trifecta of royal blue as a vintage Golden Slipper Stakes lived up to its billing at Rosehill. Trained by James Cummings, who was winning the most prestigious juvenile contest on the planet for the first time – his late grandfather, Bart, won four – the Damian Lane-ridden Kiamichi sported the yellow cap and was not among the principals in the betting, but a lack of market confidence did not prevent her finishing a length too strong for stablemate Microphone, completing a quinella for Cummings. The Blue Diamond Stakes winner Lyre was another half-length away in third for Anthony Freedman. Oisin Murphy, riding in Australia's greatest two-year-old race for the first time, finished fourth on Loving Gaby. 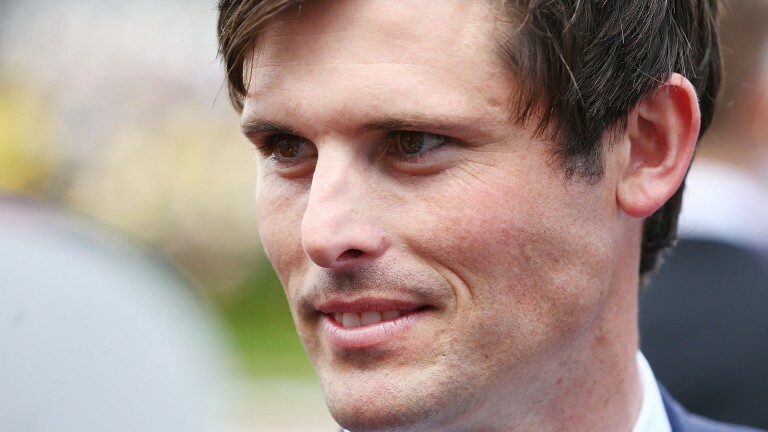 "It’s some race," Cummings told Sky Racing after winning the $3.5 million contest. "Great credit must go to this horse – she’s been able to come onto the scene and she’s just been too well to deny her the chance of running in this race. "I wanted to toughen these horses up all season and she was tough this week. She’s had a ripper of a week and she’s been squealing – she’s just been strong all the way through. She battled hard to win over 1,200 metres on debut and she’s just kept improving." Breaking smartly from barrier 14, Kiamichi was given a positive ride by Lane, who nullified the threat of being trapped deep into the bend by allowing his mount to stride on and take up the running inside the 800 metres. All 15 of her rivals came under pressure at various stages on the turn for home, but Kiamichi was still firmly on the bridle approaching 300 metres out and she was in no danger of being caught when asked to quicken for a furlong, winning with a degree of authority to continue the dominance of fillies in the juvenile division. The improving Microphone, a last-start winner of the Skyline Stakes, fared best of the colts in second, while Lyre flew home from an uncompromising position having been forced deep into the track when making her challenge. Reflecting on both the success of Kiamichi and the season for his two-year-olds overall, Cummings continued: "I knew coming into this Golden Slipper you could throw out of the window which you think is the most brilliant horse and which you think has had the picture-perfect preparation because it was going to come down to the horse who had the guts to handle the track, the occasion and have the heart to get over the line first. "The guys have done a great job all season to be meticulous with these two-year-olds and it’s fitting for us as a team. It’s the sort of thing I’ve felt really amazed to be a part of and I’m proud for them and proud for this horse. "Last but not least, great thanks has to go to the vision of Sheikh Mohammed, who has put us in this position."